The shops lining both sides (plus the Vasari Corridor above on the left) make it hard to tell the Ponte Vecchio is actually a bridge. The Ponte Vecchio (Old Bridge) links the north and south banks of the Arno River at its narrowest point. The bridge has long been a landmark symbol of the city, overhanging with little shops the way most European bridges were in the Middle Ages (though precious few have survived). The Ponte Vecchio was destroyed and rebuilt many times before the construction of the 1345 bridge you see today, designed by Taddeo Gaddi, and has been lined with these same goldsmith's shops for centuries. 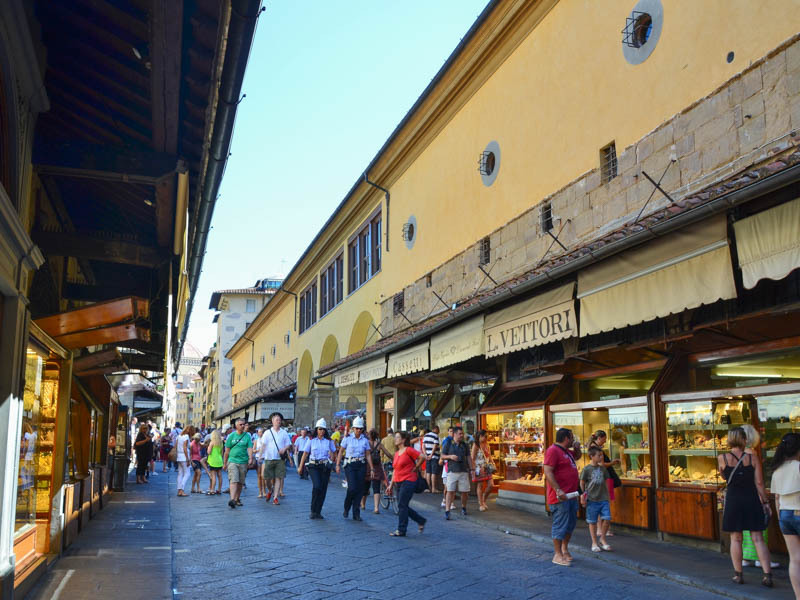 Why are there jewelry shops on the Ponte Vecchio? 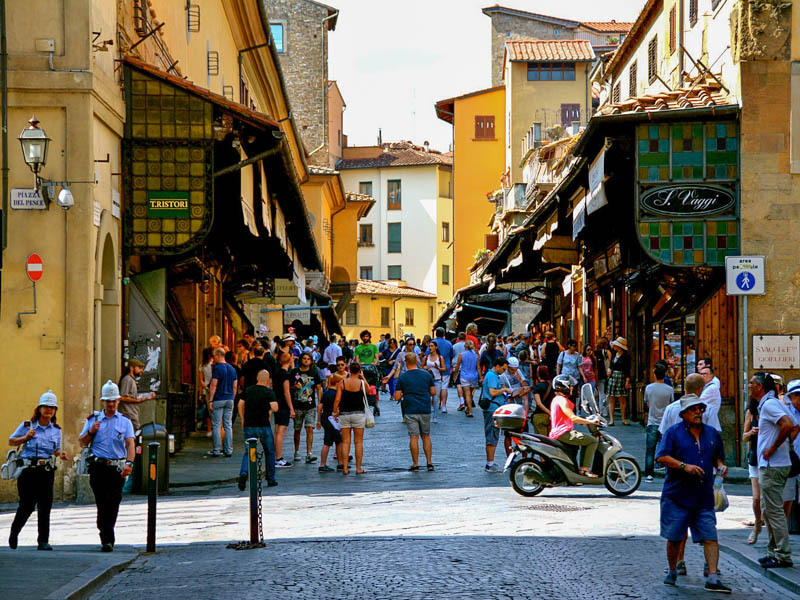 Jewelry shops have lined the Ponte Vecchio since the 16th century. Many of the exclusive gold and jewelry stores are owned by descendents of the 41 artisans set up on the bridge in the 16th century by Cosimo I de' Medici. Cosimo had Giorgio Vasari build him an elevated corridor so he could hurry between his home and his office without mixing with the crowds. Of course, Cosimo's downtown "office" was what we now know as the world-class museum of the Uffizi (which menas "offices" in local dialect), and his "home" was the palatial new Medici residence in the Palazzo Pitti on the other side of the river. This corridor still crosses the Ponte Vecchio atop the shop roofs on the eastern side (part of the Uffizi, it is still occasionally opened the public » more). Not long after his corridor was complete, however, Cosimo found something else to complain about: The stench rising to his private skywalk from the butchers and skin tanners beneath, whose workshops had traditionally lined the Ponte Vecchio since at least the 12th century. Cosimo summarily booted out the butchers, moved in the far classier goldsmiths—and, naturally, raised the rent. 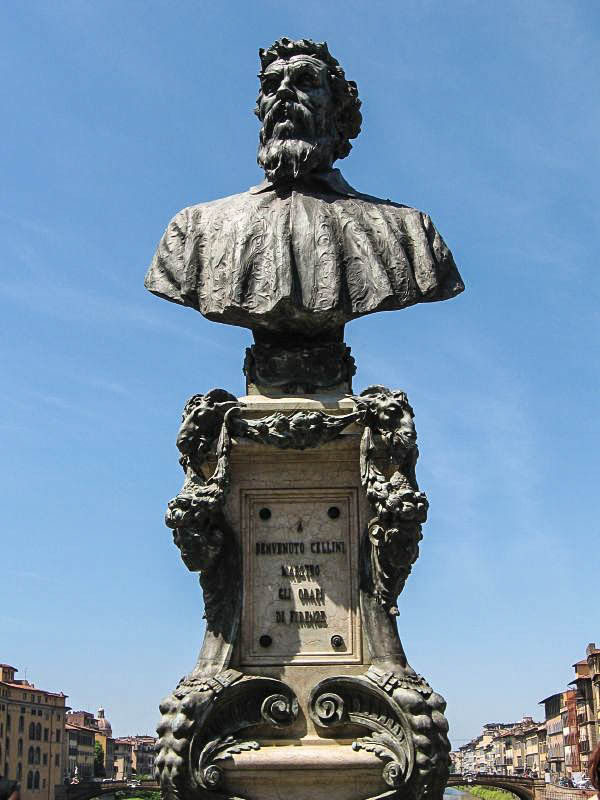 A bust (1900) of Florentine silversmith (and famed Renaissance sculptor and autobiographer) Benvenuto Cellini graces the middle of the Ponte Vecchio. The funny thing about the Ponte Vecchio is that—though the cobblestones of the street do start to rise in a gentle curve—many people don't even realize they're actually on a bridge until they get to the center, where suddenly the phalanx of shops on either side is interrupted by two small terraces, one on each side, for gazing up or down the river. Off to the side of the bridge's center, in a small piazza overlooking the Arno, rises a bust of famed Renaissance silversmith, swashbuckling autobiographer, and Perseus sculptor Benvenuto Cellini. "It is popular to admire the Arno. It is a great historical creek, with four feet in the channel and some scows floating about. It would be a very plausible river if they would pump some water into it. They call it a river, and they honestly think it is a river.... They even help out the delusion by building bridges over it. I do not see why they are too good to wade." 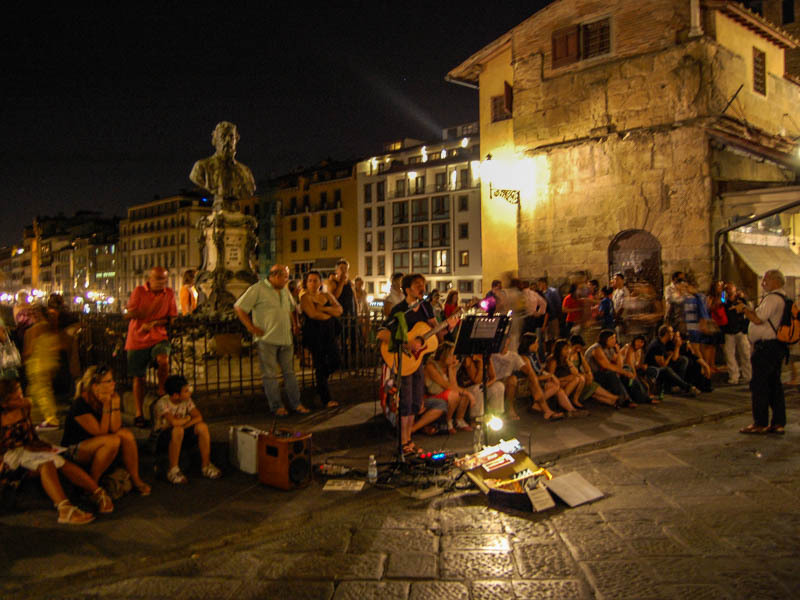 A busker entertains the evening crowds on the tiny piazetta in the middle of the Ponte Vecchio. Florentines tirelessly recount the story of how in 1944 Hitler's retreating troops destroyed all the bridges crossing the Arno—all since reconstructed, often with the original material fished out of the river, or at least according to the archival designs and with stone extracted from the same ancient quarries—with the exception of the Ponte Vecchio. Instead, the fleeing German troops bombed both bridgeheads—and the surrounding buildings—to create moutains of rubble to block the way across and slow the Allied advance. This is why most of the buildings on either end of the bridge have a distinct, 1950s look in what are otherwise the thoroughly medieval areas of Via Por Santa Maria and Via Guicciardini. The Arno flood of 1966 wasn't so discriminating, however, and severely damaged the shops. Apparently, a private night watchman saw the waters rising alarmingly and called many of the goldsmiths at home, who rushed to remove their valuable stock before it was washed away. Thanks to a new city ordinanace carrying a €50 fine (delineated by a huge, unsightly sign), you might not see as much of this as you did from the late 1990s though the first decade of the 200s, but: You'll often see hundreds upon hundreds of padlocks (especially of the brass, key-operated kind) attached to the old horse-hitching rings and railings at the two river-viewing terrace. This habit (filched from a Russian tradition, and now spread across Western Europe) is the Florentine equivalent of carving the initials of your beloved into a tree. 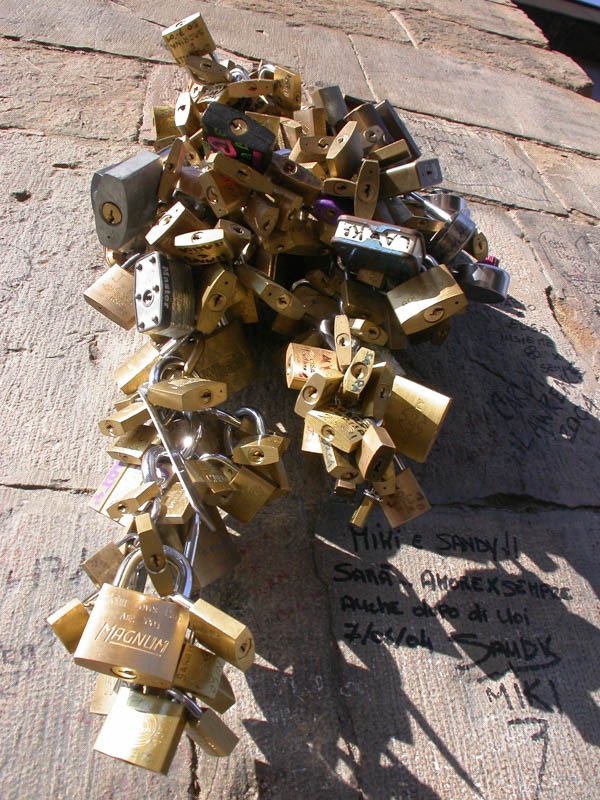 Every so often, an anonymous city worker—clearly chosen for his callousness and Grinch-sized heart—comes along with bolt cutters to remove the long daisy chains of love-locks—and the city has begun imposing a €50 fine on anyone found locking anything to the bridge. However, it is never long before they locks begin once again festooning the Ponte Vecchio, for love springs eternal in the Renaissance city. 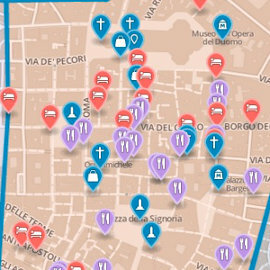 Connects Via Por Santa Maria on the north side of the Arno with Via Guicciardini on the south side. 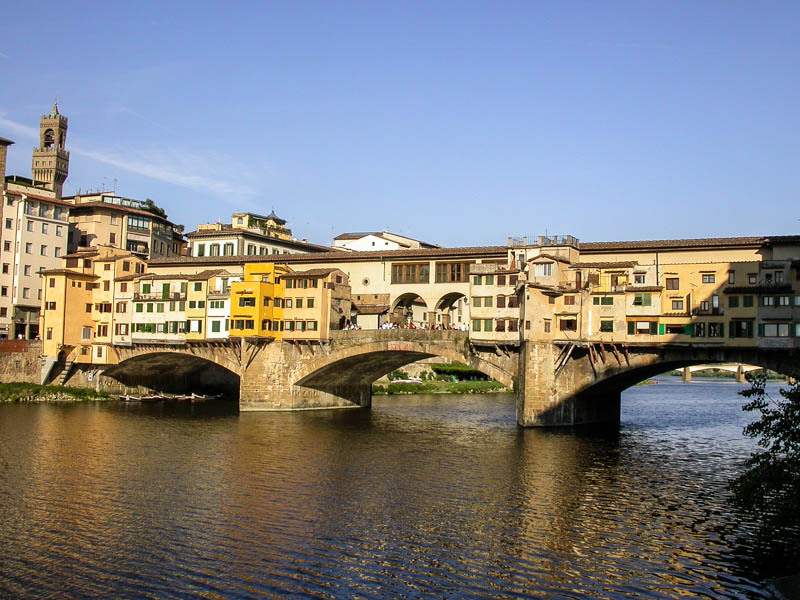 How long does Ponte Vecchio take? Planning your day: This is a bridge, and you use it to cross a river. It takes only a minute or two to cross. Yes, it is a particularly pretty bridge (and you'll want to find a spot to admire it and its overhanging shops from the riverbank), but it's not like it will take up loads of your time. Maybe you'll lean on the railing at one of the midway viewpoints for five minutes, gazing up or down the Arno, and that's about it.. Seriously. It's all overpriced, living off busloads of Japanese tourists (whose guides really should advise them to shop elsewhere). This article was written by Reid Bramblett and was last updated in March 2015.